The Moon and Venus pair dramatically after sunset on Sept. 8, 2013. This Sky & Telescope Magazine sky map shows where they will shine in the evening sky. A planetary meet-up will create a potentially dazzling celestial display this evening (Sept. 8), a cosmic show involving the two brightest objects in the nighttime sky: Venus and the moon. The planet Venus, which has been languishing low in the dusk all summer, at last manages to stay above the west-southwest horizon as late as the end of evening twilight. 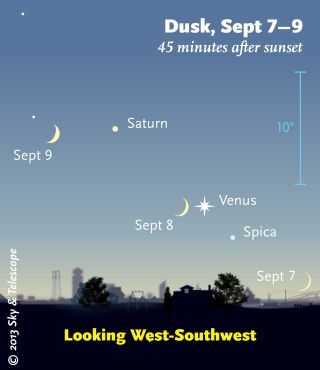 About 45 minutes after sunset on Sunday (Sept. 8), look toward the west-southwest horizon to see Venus hovering rather close to a waxing crescent moon — an eye-catching tableau in spite of the pair's low altitude in the night sky. Of all the pairings of Venus and the moon that have already occurred this summer — or will occur during this upcoming fall and early winter season — tonight's will be by far, the closest. Not to mention also that the two will attract immediate attention because of their great brightness. Venus shines at magnitude -4.1, on the astronomical brightness scale, which makes it 11 times brighter than Sirius, the brightest star. On the magnitude scale, objects with lower numbers appear brighter, with negative numbers denoting extra-brilliant brightness. The moon will be 3.5 days past new phase and about 13-percent illuminated. Look also for the beautiful phenomenon known as "earthshine" — sunlight reflected by the Earth, directed toward the moon and dimly illuminating its dark portion with a faint gray-blue glow. That effect will impart an almost three-dimensional appearance to the moon and will enhance the overall scene. Venus is currently 99.3 million miles (159.7 million kilometers) from the Earth, while the moon is only about 235,800 miles (379,500 km) away; as a result Earth appears to move much more rapidly against the background stars than Venus in the September night sky. As a consequence of this rapid movement, when the sun sets on the following evening (Monday, Sept. 10), the configuration between Venus and the moon will have radically changed. In fact, the moon — whose illuminated sliver will have noticeably widened to 21 percent — will now be positioned far to the east of Venus, and to the left, but closer to and slightly below another planet: Saturn. The moon's proximity relative to Venus will give you an excellent chance to try to glimpse Venus during the daytime. If your sky is mostly clear with little or no haze, check your south-southwest sky during the late afternoon hours of Sunday — say around 4 p.m. or 5 p.m. — and try to locate the moon, which will appear roughly about one-third up from the horizon to the overhead point (called the zenith). If you find the moon, Venus will be situated just about one degree directly above it. Try using binoculars first and then your unaided eyes. Some skywatchers in one remote locale may also watch a very spectacular sight — an "eclipse" of the planet Venus as the moon passes directly between that dazzling planet and the Earth. The event will hide Venus for about an hour or so. Astronomers call that an "occultation" from the Latin occulere, meaning "to conceal." To the naked eye as Venus begins to emerge from behind the dark part of the moon's disk, it resembles a brightening jewel on the lunar limb. Unfortunately, in order to see this beautiful sight on tonight you'll need to be stationed almost at the bottom of the world — the Falkland Islands! And if clouds block your view of Sunday's Venus-moon get together, another (albeit much wider) pairing-off will occur a month from now, on Oct. 8. If clouds or rain ruin your view of the Venus and the moon tonight, you can still find some amazing night sky views online. The Slooh Space Camera, an online stargazing website, will offer two free webcasts tonight to discuss asteroids and comets, as well as show live views of Mars in the Beehive Star Cluster. The asteroid and comet webcast begins at 9 p.m. EDT (0100 Sept. 7 GMT) and will include live views of asteroids from Slooh's remotely operated observatory in the Canary Islands, off the west coast of Africa. The second late-night webcast will begin Monday at 1:30 a.m. EDT (0530 GMT) and showcase Mars and the Beehive Star Cluster. According to Slooh officials, viewers can "watch real-time images of the Red Planet Mars as it enters the Beehive Star Cluster. This beautiful visual spectacle is an optical illusion as the Beehive Cluster is actually 577 light-years away." You can watch the night sky webcasts live on SPACE.com, courtesy of Slooh. You can also see the shows directly via the Slooh Space Camera website and Slooh iPad app. Editor's note: If you snap an amazing photo of the moon near Venus — or any other night sky sight — and would like to share it with SPACE.com for a possible story or photo gallery, please send images and comments, including name and equipment used, to managing editor Tariq Malik at: spacephotos@space.com.